Mansion is one of the places I am privileged to decorate sometimes. I am part of a team of people who all work together, and we have done it for the last 3 years. This year, we are informed that the Mansion has mold which has to be eradicated, so they have closed it for the forseeable future in order to repair the damages and shoo the mold away. This makes me very sad; the mansion is a wonderful place to work. As soon as you arrive in the morning, they set out coffee, tea, fresh lemonade, water, ice, still warm muffins and some of the best freshly baked cookies you could ever have (especially the white chunk macadamia nut cookies!). A crew of men trustees from Central Prison are at your beck and call; if you need anything you will receive it pronto. The greenery and flowers we use in the decor are provided by the mansion gardeners and once again, if you need it, you have only to ask and they will go somewhere and cut it if it doesn't grow on the grounds of the mansion. When lunch time rolls around, we are called to the kitchen, where a veritable smorgasboard is laid, including several types of desserts. We eat around a beautiful table in the main state dining room, pretending we are dignitaries (though we are dressed in jeans and sneakers). This goes on for 3-4 days, until we complete the decor. The capper of our decorating season is the Governor's party for NC State employees; and while we are not strictly employees, we are included in this party, to thank us for our labors. I am missing it already! Note: the temporary mansion will not need to be prefessionally decorated because it will not be open to the public for tours. 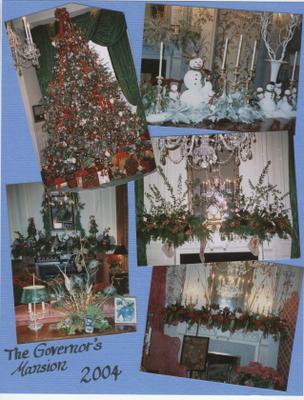 The Governor and his family go to their private home for the holidays. Everyone is blogging about food. I am so hungry now but wait...all I have to do is read about food and it makes five pounds just stick...swack! I agree the white chocolate chunk macadamia nut ones sound yummy. I'm not much for chocolate but white chocolate is a different story. You have really made my mouth water describing all the food. I've never had the opportunity to see the inside of our stately mansion. The outside always makes me think of a gingerbread house. I bet you do lovely things with it at the holidays. The sustenance, I feel sure, is well and hard earned. How wonderful it must be to have that opportunity. It is sad that there's the mold problem. Hopefully, it will be resolved soon. Those cookies and muffins sound yummy! OH, MOLD IS TERRIBLE!!! Sorry you're going to miss out this year. Sounds like an ideal work environment. A reminder for Friendly Friday! This sounds wonderful! I'm so sorry to hear it won't be happening this year - does the govenor need his temporary residence decorated? It must be nice to enjoy a job so much. Hopefully it won't be closed for long. Where will the Gov. be residing? Won't it need decorating as well? Michele sent me this time, I'm behind you in line. That's a bummer! I've got mold AND dust out the wazoo. Thank goodness for Zyrtec. Well that's terrible, Judy. Does this mean you will go hungry? Maybe can send you some canned Spam by email if you're really desperate. You can come to my place! *groan* Now I'm hungry. That job sounded just about perfect--desserts can make everything better. I would be sad too. That sounds like an awesome experience!! Hmmm. title sounded sarcastic... text sounded sincere... and macadamia nut cookies sound good... maybe next year. Oh...bummmer! And I LOVE those kind of cookies!